American theatrical manager; born at Sandusky, Ohio, about 1858. He began his theatrical career as advance agent for Haverley's Mastodon Minstrels. Afterward he held a similar position with Collender's Georgia Minstrels, with whom he went to the Pacific coast. Here disaster overtook them, and Frohman had to travel East as best he could. Arriving in New York city, he obtained the road rights to plays produced at Wallack's (afterward the Star) Theater, but was not particularly successful until 1895, when he conceived the idea of a theatrical trust to control playhouses throughout the country. Interested with him were Nixon and Zimmerman, who owned two theaters in Philadelphia and several in other towns in Pennsylvania and Ohio; Klaw and Erlanger, who controlled a chain of theaters from Washington, D. C., to New Orleans; and Alfred Hayman, a capitalist who controlled playhouses throughout the West. The syndicate began with thirty-seven theaters, and at once forced its weaker rivals to the wall. 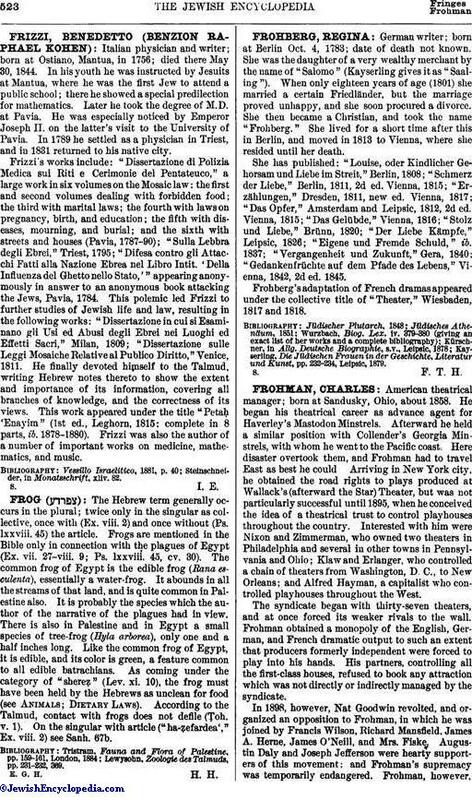 Frohman obtained a monopoly of the English, German, and French dramatic output to such an extent that producers formerly independent were forced to play into his hands. His partners, controlling all the first-class houses, refused to book any attraction which was not directly or indirectly managed by the syndicate. In 1898, however, Nat Goodwin revolted, and organized an opposition to Frohman, in which he was joined by Francis Wilson, Richard Mansfield, James A. Herne, James O'Neill, and Mrs. Fiske. Augustin Daly and Joseph Jefferson were hearty supporters of this movement; and Frohman's supremacy was temporarily endangered. Frohman, however,maneuvered until Goodwin seceded from the opposition. He was followed at intervals by all save Mrs. Fiske and Daly. The death of the latter left Mrs. Fiske to battle alone with Frohman, who was so absolutely in control of the situation that she was not able to play in New York city during 1900-01. 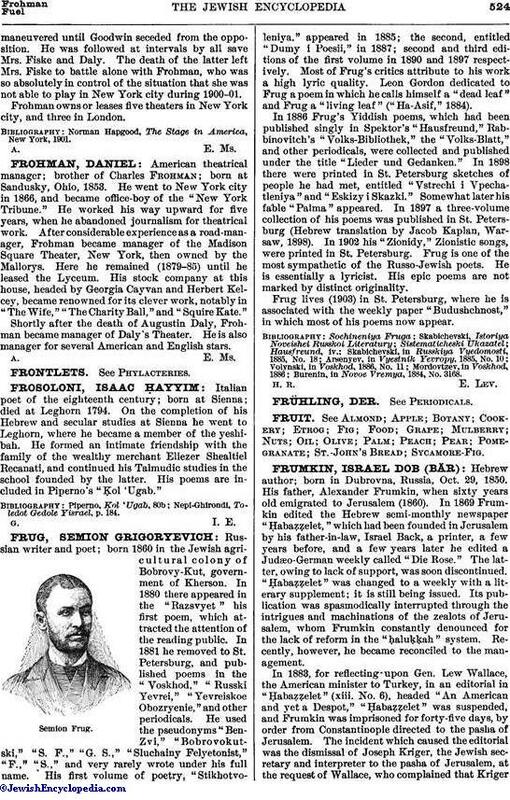 Frohman owns or leases five theaters in New York city, and three in London. Norman Hapgood, The Stage in America, New York, 1901.